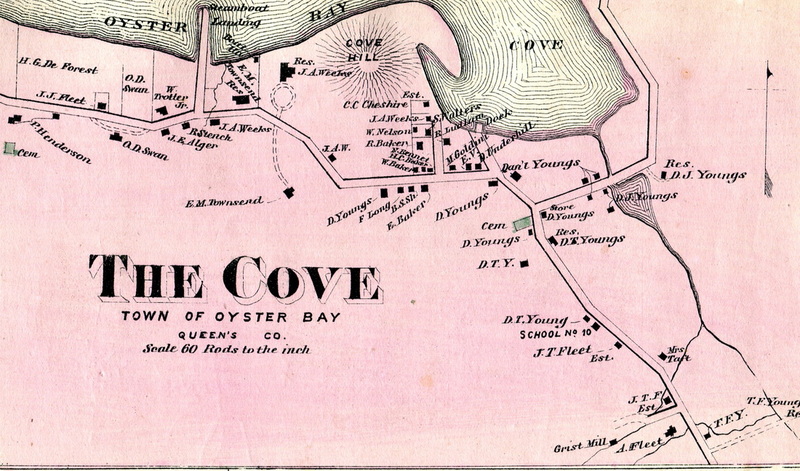 This project focuses on the digitization of the atlases in the Oyster Bay Historical Society archives collection, with specific emphasis on plates depicting Oyster Bay Hamlet and the surrounding villages. Map Showing Approximate Location & General Direction of Bridle Paths Maintained by the Country Lanes Committee in District Bounded by Glen Cove, Oyster Bay, Cold Spring, Woodbury, Jericho & East Williston Including Locust Valley, East Norwich, Roslyn, Brookville, Wheatley, Old Westbury, Westbury and Syosset: June 1924. The Country Lanes Committee that produced this map formed around a core of equestrian hunt enthusiasts from Piping Rock Club, annoyed by the automobile’s increasing encroachment on open fields. But even worse than the automobile was the real estate boom in the years before the First World War, as agriculture made way for “estates”—garish, private and hostile to horseback riding. Beginning with a two-square-mile tract of property under the ownership of several Piping Rock members, the Committee developed a network of paths over two hundred miles long through a district nearly ten miles square, avoiding wherever possible the motorized traffic of macadam roads. Trails were marked with green enamel signs bearing the initials “P.R.C.” – originally standing for “Piping Rock Club” but easily broadened to mean “Private Road Committee.” Still, to ensure that newcomers to the trails didn’t get hopelessly lost, the Committee printed maps of the district, as evidenced by the Society’s 1924 edition. Source: New York Times. 3 Aug 1913. A map of the late Henry Fleet's farm of Oysterbay Cove, surveyed for the comissioners and divided as they directed, by Newberry Sprague, Surveyor, March 16th, 1864. Pen & ink and watercolor on paper. Inscribed by Commissioners McCoun, Jones, and Youngs: "Approved by us as Commissioners in making the partition." Funded by a Gerry Fund grant for purchase by the Society for the Preservation of Long Island Antiquities. Donated to the Oyster Bay Historical Society 2008.